Messages of congratulations are flooding in for Perth mum Kim Tucci, who has given birth to five babies – four girls and a boy – after a one-in-60-million chance pregnancy. Babies Ali, Penelope, Tiffany, Beatrix and Keith have joined big sisters Aiva, 4, Indiana, 2, and brother Kurt, expanding the Tucci family from five to ten in just a day. The couple sold the story of her pregnancy and their babies to Woman’s Day for an undisclosed sum, revealing their arrival more than 10 weeks early via the magazine’s Facebook page this afternoon. Not due until April 12, Woman’s Day revealed all five babies were delivered safely yesterday (January 28) in only two minutes, making for one very happy ending to a remarkable story. Kim says the babies were conceived naturally without the use of fertility drugs or IVF. Hoping for a boy this time around (Kurt is her son from a previous relationship), Kim and husband Vaughn were shocked when a scan at five weeks showed five embryos. “We’d always wanted three kids. Vaughn was happy with any gender, but I really wanted a boy for him,” Kim tells Woman’s Day. Photographer Erin Elizabeth Hoskins snapped precious photos of Kim at 24 weeks. “With two beautiful daughters, Kim and her husband decided they wanted to try for one more – possibly a boy? So you can imagine their utter shock upon discovering that they were expecting their little boy…along with four more girls. A one-in-60-million chance pregnancy,” Erin says. 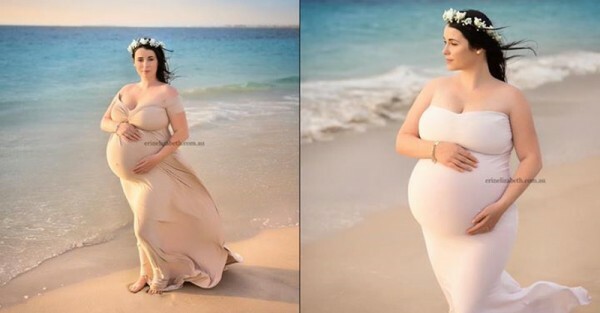 Kim, 26, had shared her pregnancy journey with more than 130,000 followers on her Facebook blog, Surprised by Five, but removed all photos of the pregnancy earlier this month after the family signed the exclusivity deal with Woman’s Day. But she still shared details of how she was coping physically with so many babies growing inside. The mum of eight – she also has a son, Kurt, from a previous relationship – carried her babies to the third trimester and says she is very thankful to have made it so far and to have been blessed with five healthy babies.